The Thames Trot event is my traditional first event of the year and takes place starting from Oxford and traditionally follows the Thames Path along the river finishing at Henley. This year the unprecedented levels of rainfall over the past few months meant that large sections of the Thames river had been flooded and heavy rain in the week prior to the race meant that course had to be diverted. So after a final course inspection on Thursday, updated instructions were sent out Friday resulting in my evening being spent marking the new route on my map and adding a version onto my Garmin as a backup. It all looked ok to me apart from the last leg from Binfield Heath where it followed a narrow trail and into an area that I’m unfamiliar with. I also calculated the new route would be around 42 miles as opposed to the usual 48 miles so it was likely I would finish an hour earlier than normal. 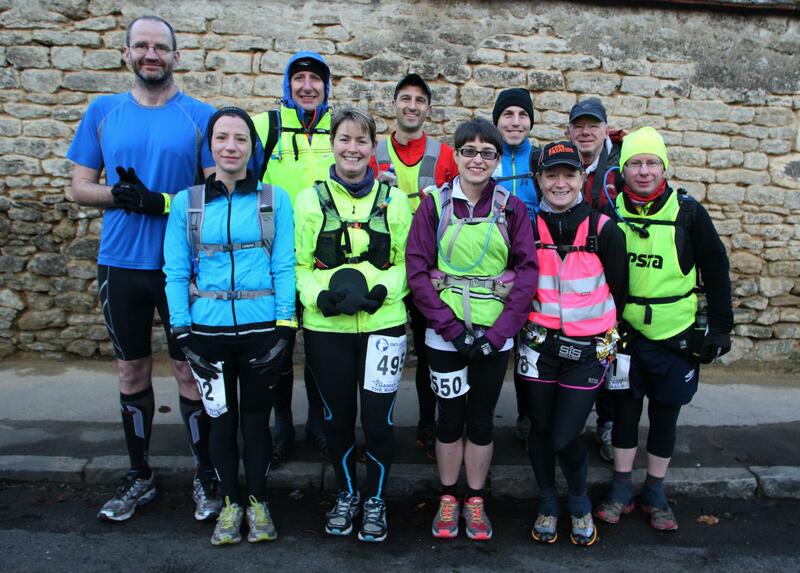 I managed to get a lift to the start with a couple of other runners (Jim and Michael) and met up with the Stouty and my local club mates the Reading Joggers team. There were 9 Reading Joggers taking part with a real mix of experience from Ultra veterans to Ultra newcomers and everyone was looking forward to getting started. There were 266 people taking part which was the biggest turnout for this event since it has started and it was pretty busy at the start with people cramming into the pub to get registered and queues for registration and the toilets. I suspect the volume of competitors may have outgrown the pub as a venue and the start was delayed by about 10 minutes as a result. The plan today was to go out at a decent pace and see how I could hold it. I was travelling light today with just the UltrAspire race vest, a few gels, a few snacks, my maps and a soft bottle of water. No kit changes or long stops were planned. It was pretty cold in the morning as we lined up at the start of the race. Unusually for us, Stouty and I lined up at the front of pack for a quick start. This was purely to beat the crowds over a narrow lock a few hundred meters from the start and get onto the trail. We normally start near the back and gradually overtake people until we find our natural position but with a large field and muddy and wet conditions we didn’t fancy being caught behind any large groups so a change of strategy was required. There was a final few second countdown and we were off! Stouty and I set off with Wendy Shaw (another Reading Jogger runner) and we were grinning to ourselves as we headed down towards the lock thinking this was madness, it felt like a 10k race! We went over the lock with some quick 90 degree turns and onto the first trail which was flooded and splashed through the these puddles resulting in soaked feet less than 10 minutes into the race. I realised I hadn’t started my Garmin and switched this on as we kept up a good pace (sub 8m/m) although we both needed a quick comfort stop early on. The weather was pretty good for running, cool and no rain and I was feeling quite warm after the early pace of the race. We crossed the railway line as part of the first diversion and headed into Abingdon past Radley College. The leaders had disappeared out of sight but we spotted Wendy ahead who was wearing a bright pink hi-visibility top so difficult to miss! As we entered into Abingdon, we slightly overshot the turn for the bridge but headed back and gave Wendy a shout who had done the same thing. We followed the A415 to the first checkpoint where I spotted Arthur the Reading Joggers coach who had come out to support the team. I grabbed a small bottle of water, grabbed a bit of the lovely fruit cake on offer and carried on. We continued at our just under 8m/m pace on average which I thought was a little too quick but we were near the front of the race and we followed the road to Appleford and then onto a track path and through a muddy field towards Little Wittenham. Here I lost sight of Stouty as he was a little behind me but I carried on through Little Wittenham Wood and if I remember correctly this was really muddy and I almost lost my shoe here a couple of times and was slipping all over the place. 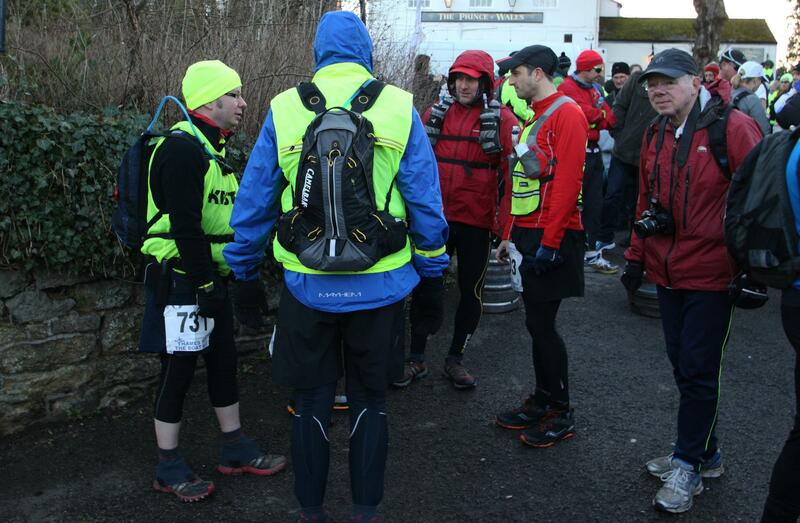 The organisors advice had been road shoes as 75% of the course was now on the road but the 25% that was on trail had some really wet and muddy conditions and I suspect there was no right answer with the shoe choice today. I wore some lightweight trail shoes which I thought was the best of both worlds but still ended up slipping around in the mud. There was a momentary pause around here with a group of runners ahead of me but I was fairly certain of my directions and waved everyone on ahead… no pressure if I got this wrong! I had a brief chat with Luke Ashton around this point and also hooked up with a guy called Ken and we chatted a bit as we ran. We crossed the bridge near Days Lock and headed onto the A4047 toward the second Checkpoint at Benson. Again, I didn’t hang around here and topped up with water had another bit of cake, said hello to Adrian from the Reading Joggers who was on official crewing duties and headed out back onto the A4074 to Goring. This road to Goring was long and tedious and seemed to go on forever. Luke was looking to pull ahead but wasn’t 100% certain of the route having lost his directions. Luckily I had a spare copy on me and gave him the spare as he eased on ahead. Ken and I stuck together for a while as we headed towards Checkpoint 3. This was a bit of a slow moment as I felt my joints aching from the pounding on the road especially my hips. I arrived at Checkpoint 3 and grabbed a couple of sausage rolls and a bag of crisps here and walked out of the Checkpoint munching on the food before I broke into a plod. A guy called Steve joined me and we followed the road left at the station and then onto a trail track towards Whitchurch. I had been flagging a little before the third Checkpoint to be honest but felt a bit better now after a bite to eat and a gel. We bumped into another couple of guys including following Fetcheveryone member Howard (Oranje) and headed through the woods and up and down the hilly stretch. The other guys went on ahead as I paused for a comfort break and was soon joined by a Scottish runner Caroline who had caught me up. We ran and chatted together for a bit as we exited the wooded area and then headed right through Whitchurch. Unfortunately, we couldn’t see Howard and Steve ahead at all and I suspected they may have taken a wrong turn. We went over the toll bridge into Pangbourne through the railway bridge and left onto the A329 and up the gradual incline of Purley rise. 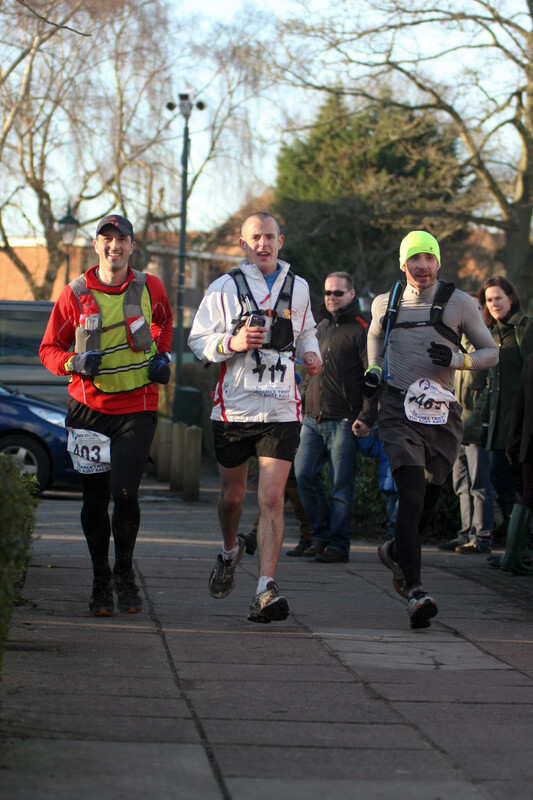 I was feeling ok a this point having covered the first 26.2 miles in 3.47 and was averaging 8-9m/m pace. The next checkpoint was ahead and I recalled we had to take a left hand turn somewhere to get to it and I slowed to dig out my map as Caroline headed on with another group who had come up behind us. After checking my directions I headed on and could see the other group missing the turn ahead. I called out to them several times but they were out of ear-shot and couldn’t do anything else (sprinting ahead was not on the cards here!). I took the left turn, saw a work colleague out walking her dog and said hello and got to Checkpoint 4. I informed the marshals a few people had probably missed the Checkpoint and then headed out as I saw Ken again who was had stopped to change his socks before running on. I followed the A329 before taking the turn onto the Thames Path and followed this into Reading and towards the next Checkpoint. The path here was flooded in several places and it was a question of feet getting wet, drying out, getting wet. I was wearing the same pair of Drymax Trail socks for the whole race and didn’t suffer any blisters. The socks did a good job of drying out my feet and I will definitely be using these again for this type of race. I spotted Arthur again near Reading Town centre who told me that runners had been going all over the place. This was likely to happen with last minute route changes and a more difficult route to follow and I plodded on ahead past Tesco’s and then Thames Valley Park where I spotted Ken taking the wrong path into Thames Valley Park. This time I was close enough to give him a shout and we hooked up again as we continued through the field to the worst flooded area where we both had to wade through water which was up to our shins. In fact, the freezing water felt good on my calves although my feet were cold and we plodded on towards the next Checkpoint. Luke caught us up here having been ahead of us and then detouring off route and we arrived at Checkpoint 5 in Sonning at the same time. I grabbed some water and headed onwards. Knowing that part of the route ahead went up a long gradual incline I was going to push on for a bit and ease off there. I followed the road towards the main roundabout and up towards Playhatch where I walked up the hill but was joined by Ken again who caught me up. We got to Binfield Heath which was the point at which I was now unfamiliar with the route. We found the footpath and headed through here towards High Wood where Luke and a couple of other people drifted past us. I had a bit of an energy dip here and rummaged around my race vest before finding and eating a snack bar, gel and drank some water and I walked through this muddy section for a few minutes before breaking into a gentle run. We arrived at a point where we were a little uncertain of the route but another runner caught us up and sounded pretty confident on his directions and tagged along….. unfortunately we must have missed the path we should have followed and we ended up coming out to a main road at a different place to where we expected to be. We continued along this road and were passed by Arthur in his who beeped his horn at me in warning to which I just waved. He was actually telling me I was going the wrong way but he couldn’t stop on this busy road. We ended up on the A4155 and heading back towards Reading before we finally realised our mistake and turned around. All in all, we added an extra 2 miles to our route. With the route being shortened from 48 to 42 miles we couldn’t really complain but it was a little frustrating to have to add that 15-20 minutes extra when we were only a few miles from the end. The last couple of miles led us into Henley and we jogged along here and then headed to the Station finishing together in a time of 6.49. I was pretty pleased with the time and suspect this was one of my quicker efforts although the distance and route was not comparable to previous years. I ended up 33rd/266 which could have been a touch better if I hadn’t added some extra miles at the end but I suspect this happened to quite a few people today so perhaps evens itself out. My tactic of travelling light worked well, I carried just what snacks I needed, wore what clothes felt suitable and didn’t feel the need to stop and change kit (socks or trainers in particular). At the end Wendy had already finished about 10 minutes ahead I think and Arthur was already there and I got changed and waited at the finish for the other runners to come through. It was great to support people you know at the finish and there was a steady stream of familiar faces over the next hour or two as people finished the race. I should add some congratulations to the Reading Joggers team, all of which started and completed the event, great effort guys! It was great to see the delight peoples faces particulary as they finished their first Ultra after a whole day out on their feet. Well done to the GoBeyond team for getting the event on with the last minute changes. To be fair, more markings on the route would have been useful particularly at key turn points but I appreciate the team were working with last minute changes. I would have been more disappointed with a cancelled event than a slightly shortened route with the risk of a few navigational errors. That’s my 5th Thames Trot in a row now and I will hopefully be back for the 6th next year.